that $2,000 was the minimum… who knows? what is the process to sign up through ATC Cayman’s, instead of ATC Oanda IB? do we open an account through http://atcbrokers.com/en-ky instead of http://atcbrokers.com/en-us ? I think we can forget about ATC Brokers (Cayman Islands). 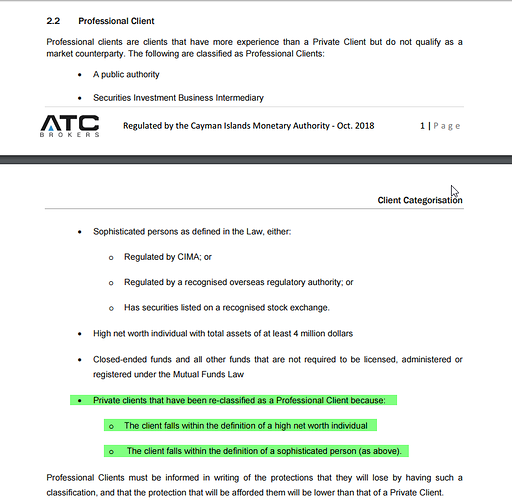 On closer inspection, ATC Brokers is a dead-end for U.S. residents (other than high-net-worth individuals). In other words, for almost everyone on this thread, ATC Brokers is nothing more than an IB (reportedly for Oanda). If you want to open an account with Oanda, do it directly – you don’t need to go through ATC Brokers. ATC Brokers is a member of the U.S. National Futures Assoc. (NFA), the sock-puppet of the CFTC. ATC Brokers is not going to incur the wrath of the CFTC/NFA Nanny State by trying to onboard U.S. residents who do not qualify as professional clients. Also, it’s most likely that the IB contract between ATC and Oanda stipulates that ATC will not accept non-professional U.S. clients, but will refer them directly to Oanda. If that is the case, then ATC has no incentive to onboard ordinary U.S. traders directly. just got there email on my account status, we can forget ATC Brokers Cayman if we live in the U.S.A. Thank you for your interest in ATC BROKERS. Your application has been received and thoroughly screened by our New Accounts and Compliance Departments. We regret to inform you at that we are unable to accept your application as you are currently residing in the United States. If you have any questions please contact compliance@atcbrokers.com. Yeah they’re my go-to broker at the moment as well. latest on UpayCard, they won’t accept US Bank wire transfers. Tradersway says it has a min of $5000 for US wire transfers, but you better check because that was 4 days ago. The way things are going you need to use a US broker or get Trump to kill Dodd-Frank bill. What is the latest on the broker list?? Coinexx wants you to use Bitcoin which I’m not familiar with, exchange rates…brokers… currency transfer?? REGULATED BROKER BERNDALE CAPITAL ? regulator in Australia. Traders’ funds are frozen. i also received the FX Choice email regarding wire transfers – this is a big concern for me, the notice is giving clients 3 days to withdrawal through wires before the suspension. im left with withdrawing through BTC, which they charge a 3% fee going from fiat to BTC.